Minor WordPress version updates are fairly safe to apply. I had never seen a serious bug being introduced in a maintenance release – heck, that’s what the releases are for, right? That is, until a friend reached out saying that all Media uploads that had spaces in their file names started getting hyphenated titles. Sure, she could manually fix the titles after the upload, but with image-intensive sites, that’s just not practical. I did some digging and it turns out that this is a known bug introduced in WP v4.6.1. The fix is ready for WP 4.6.2, but as of this writing there is no date scheduled for that release. There is, however, a workaround in the ticket, and I’m adding it here for your benefit. Just copy the code below and paste it at the end of your theme’s functions.php file. Make sure to paste it before any closing ?> tag. Actually, if your functions.php has a closing ?> tag at the end of the file, feel free to remove it. It’s bad practice to keep them lying around that way. Kudos to @SergeyBiryukov for the fix. Remember to remove it after you install WordPress 4.6.2. It won’t break anything if you don’t, but it’s redundant and will just take up some un-necessary CPU cycles. P.S. Check out our Website Care Services and let us help you keep your site up and running. eShop PayPal Pro Merchant Gateway allows you to collect Credit Card payments without the need for your client to leave your site. Go to the Settings -> eShop -> Merchant Gateways and enter your sandbox and live PayPal credentials. 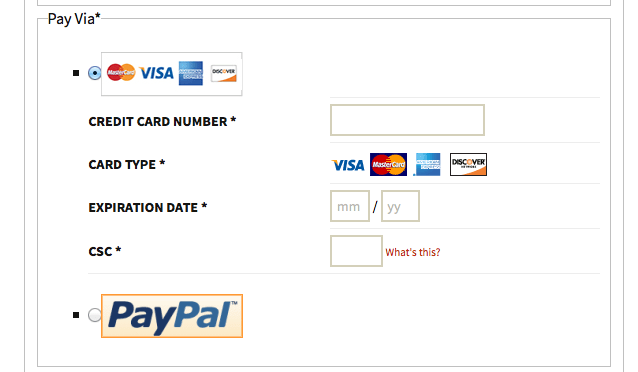 eShop for WordPress comes with basic PayPal support out of the box. This means that your client gets sent to PayPal to make their payments and has the option of not returning. With eShop PayPal Pro Merchant Gateway plugin, you can collect the payment directly from the checkout page, no redirections to outside servers whatsoever. For PCI compliance, no Credit Card data gets stored. It is up to you, however, to set up SSL on the checkout page. Once you activate this plugin, a new section is shown under Settings -> eShop -> Merchant Gateways. 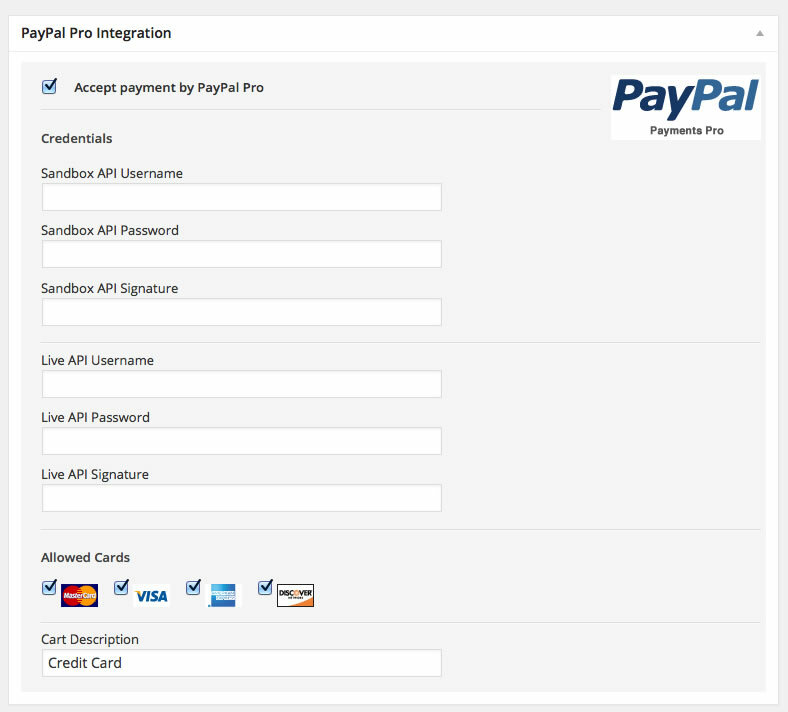 Tick the ‘Accept payment by PayPal Pro’ box and enter your Sandbox and Live PayPal credentials (API Username, API Password, and Signature). If you don’t use PayPal Payments Pro yet, click here to learn more about it. Tick the credit cards that you want to use – note that PayPal does not allow American Express and Discover in certain regions. Make sure to test those cards before going live. Test credit card numbers can be found here. Click ‘Save Changes’ and you’re good to go. When your clients reach the checkout page, they will see the Credit Card option as one of the payment methods. If it is the only active option, the CC fields will be visible. The type of credit card is identified automatically when the clients type in the number. If there are more Payment options, the fields will only be displayed if the clients click on the CC radio button. 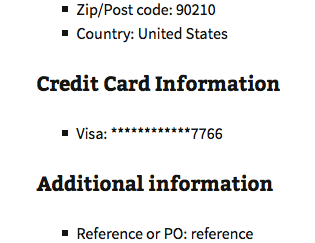 The confirmation page will show only the last four digits of the credit card number and card type. eShop Multi-Currencies plugin allows you to offer your products using over 165 currencies, with automatic exchange rate updates. Go to Settings -> eShop -> Currencies tab to customize your settings. eShop Multi-Currencies plugin for WordPress gives you the ability to offer multiple currencies to your visitors. Select from over 165 currencies and display your chosen ones via a widget or shortcode. eShop’s default currency settings (base currency and base currency symbol) are moved to the new Currencies tab under eShop -> Settings, where you can also select whether to fetch exchange rates via OpenExchangeRates.org. Display allowed currencies using either a shortcode or a widget. Once you activate this plugin, a new Tab is shown under Settings -> eShop -> Currencies. The new currencies tab on the far right. You will also find that the currency symbol and currency options that were originally under ‘General’ and ‘Merchant Gateways’ tabs, respectively, have been moved to the new tab under the ‘eShop Base Currency’ box. In addition to those two items, you can also select to have the plugin always send the base currency to the merchant gateway, or whatever currency the client has selected. CAVEAT: This is a potentially dangerous option, depending on the merchant gateway. Potential issues include failed transaction due to currency not accepted by the gateway, failed transaction due to given currency different from base currency without explicit acceptance in the gateway settings (outside of eShop), or even additional currency conversion fees. Make sure you know what you’re doing and test it out in a sandbox before using this option. When dealing with multiple currencies, the system needs to know the exchange rates for each selected option. 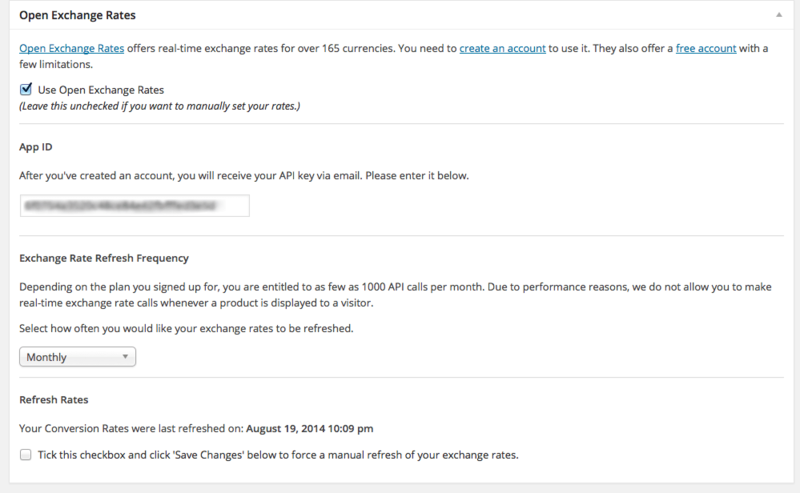 The plugin comes with integration with http://openexchangerates.org and instructions on how to get a free account. Due to performance reasons, exchange rates are not fetched in real time, but scheduled from hourly to monthly. You can also force the system to update on demand. The next section is for the actual allowed currencies. Choose as many currencies as you want (remember to play by your Merchant Gateway’s rules), and set the name, symbol, conversion rate (if you’re not using OXR as that sets it for you). You can also adjust fixed rates and percentages if you feel you need to. If you want to deactivate a currency without actually removing it, just toggle the ‘Active’ checkbox. To help you keep track of the currencies the sales have been made in (for those passing the non-base currency to the Merchant Gateways), All orders screens have been updated to display the 3-letter currency code instead of the base currency’s symbol. Currency preference is kept via a cookie in your customer’s browser. When he completes the payment and opts to create an account, the preferred currency is stored and is viewable/modifiable under your customer’s profile screen. This plugin uses shortcode_exists(), which was added in WP 3.6. It has been tested with WP v4.1 and newer. This plugin has been tested extensively. We do our best to provide as bug-free code as possible, but we cannot possibly test with all the different scenarios in the wild. If you find a bug, please let us know via our contact form. We’d like to thank Triple Ace Games for helping fund this project. Feel free to pay them a visit as they have some pretty cool products :). Canada Post Shipping Rates for WooCommerce allows you to get Canada Post rates with more control over the countries you ship to. Go to WooCommerce -> Settings -> Canada Post and follow the instructions to connect to Canada Post and customize your settings. It allows you to opt to use default service options for every country not in the country list. I was once caught by surprise when using Woothemes’ Canada Post plugin. I installed an update and suddenly I was asked to go to Canada Post to enter my Credit Card information. All the while my customers were unable to place orders. This plugin does NOT involve entering Credit Cards in any way. I sell a lot to Brazil, and because of that I wanted to translate the shipping options for Brazilians only. I also wanted to control which International services were available when shipping to that country. With this plugin, the specific countries selected will have each its own services section which you can control however you like. In case you decided to have country-specific settings for one or two countries and would like to have blanket settings for everyone else, just tick ‘Use Default’ to get the Default Services list displayed. WordPress USPS Tracking Plugin allows you and your clients to track a shipment via USPS. It will work nicely with any WordPress configuration and does NOT depend on an e-commerce plugins. WordPress eShop Coupons Plus Plugin extends the coupon/discount code functionality for eShop with fixed value and per-product discounts as well as allowing limiting coupon use on a per-client basis. To use it, place the Snippet Group shortcode to control where on your page/post you want the appropriate Snippet to be displayed, and that’s it! The plugin will check for all snippets associated with the shortcode’s Snippet Group and will decide which one should be displayed according to the control settings for each Snippet. If more than one Snippet match the display conditions, a random one of the matching set will be selected. This add-on for eShop allows you to specify stock on a product-by-product basis. This add-on for eShop Shipping Extension allows you to specify free shipping on a product-by-product basis. This add-on for eShop allows you to specify a State/County/Province to which shipping will not be charged.